Days from now, Karl Malone will join John Stockton and Jerry Sloan in the Naismith Basketball Hall of Fame. Let’s fete and honor the greatest duo in NBA history with Stockton-to-Malone Week. S2M Week is brought to you by my digital pack ratting, est. circa 1995. You think that ref is fearing for his life right about now? The news arrived like a punch in the stomach. Stockton had undergone knee surgery, and would be lost to the Jazz for as much as three months. Yet even as the public address announcer introduced the rest of the Jazz players and the fans turned up the volume on their cheers, the expression on Stockton’s face never changed. His mouth sat in a flat line across his face, and his eyes seemed to be focused not on anything in particular…And when his name finally came across the sound system at nearly 100 decibels and the crowd went out of its mind with adoration, Stockton simply blocked out the anxiety and the emotion, slapped the proper hands on his way through the gauntlet of his teammates, and ran to the center of the first pregame huddle of the rest of his surgically repaired life. The Jazz won the opening tip, and not ten seconds had ticked off the clock before Stockton got the ball in his hands and passed to Hornacek on the right wing. At the same time, Malone ran from the low post to the free throw line, and set his hard body directly in the path of Indiana point guard Mark Jackassson. Stockton made his free throw, and that play alone probably would have qualified Stockton’s return as a success, but Stockton was far from finished. So, like the cantankerous player he was, Stockton charged right back into the key on the Jazz’s very next possession to set another hard pick on Davis. This time, Davis clobbered him even harder, sending Stockton sprawling to the floor between Davis’s legs. Sloan, his righteous outrage now reinforced, turned back toward the refs. “He kicked him!” he screamed again. With Davis guarding him, Malone called for the ball, got it, and ran right over Davis on his way to the basket. The refs made no call, and the layup scored. That inspired Indiana’s Reggie Miller, on the Pacers’ next possession, to show a little solidarity and try laying a hard pick on Malone, which is about like a palm frond deciding to set a screen on a fire hydrant. The Jazz end up winning the game, 106-97. Stockton declined to speak specifically about his rehabilitation schedule, answered most of the questions in his typically vague and standoffish way, and even shot a reproachful glance at one reporter who had the teremity to ask Stockton’s wife if Stockton had been difficult to live with during his recuperation. Yeah, it was the same guy, all right. 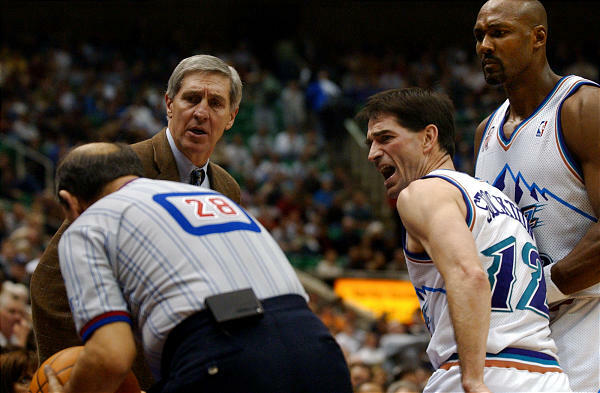 ← Stockton-to-Malone Week: Karl’s work ethic and disdain for pain were…wait for it…legendary.